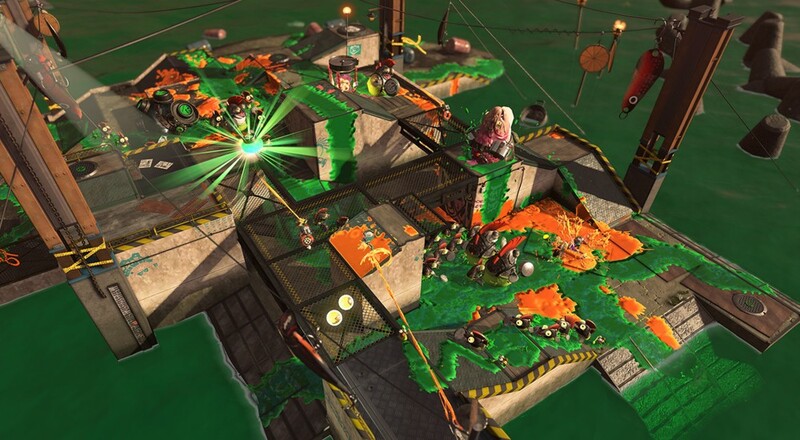 The main hook to "Salmon Run" is that in addition to fending off waves of enemies, called "Salmonids," you and your teammates will also need to collect a number of "Golden Eggs," which drop from bigger foes, within a set time limit. Even after you collect all the eggs, however, you still have to survive the remainder of the wave. The mode also has a difficulty setting that goes from 5% (easiest) to 100% (hardest). Even on the easiest difficulty, you'll need to work with your teammates to call out bosses and incoming threats. The mode will support four player local/LAN play, which it sounds like is how the developers intended the mode to be played so players are in constant communication with one another, and four player online play. In the online version, there will be "seasons" that affect what weapons you can use and the enemies you face. The LAN version will allow players to freely select their gear. In both modes, collecting the Golden Eggs (and collecting more than the quota) can unlock special gear for you to use. Splatoon 2 is out next month on July 21 for the Nintendo Switch. Page created in 0.8523 seconds.